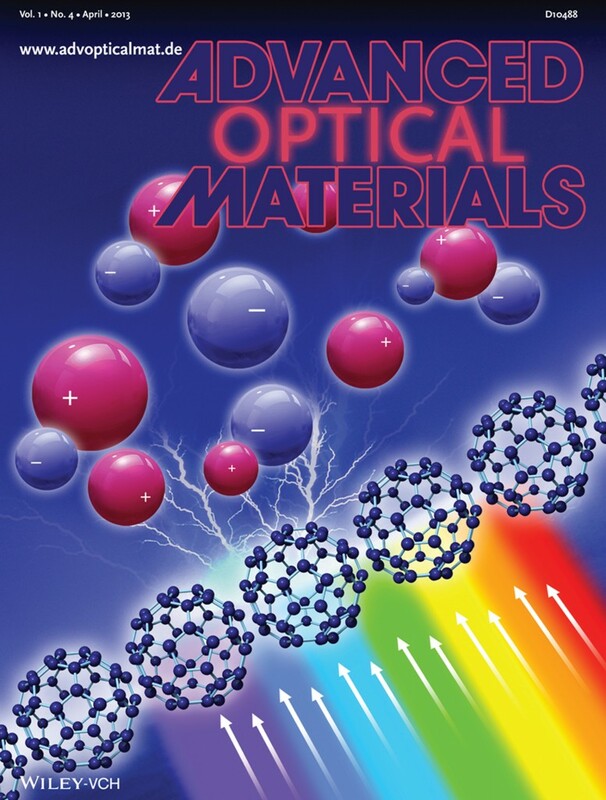 On the Cover: J. Huang and co-workers report a low-noise, highsensitivity, fullerene-based organic photo detector with a wide dynamic range. The enhanced dynamic range depicted here is achieved via an inserted cross-linkable buffer layer. The device described on page 289 shows an excellent linear response from indoor light intensity to 12 pW m−2, corresponding to a linear dynamic range of 90 dB. This is among the highest reported for any organic photodetector, and larger than those of inorganic photodetectors such as GaN and InGaAs. Fawen Guo, Zhengguo Xiao and Jinsong Huang. 24 April 2013. Photodetectors: Fullerene Photodetectors with a Linear Dynamic Range of 90 dB Enabled by a Cross-Linkable Buffer Layer. Advanced Optical Materials 1(4), pp. 275–348. Jinsong Huang is assistant professor of mechanical and materials engineering. Fawen Guo and Zhengguo Xiao are graduate students.